Engraving. The process of cutting a design into the surface of glass, either with a diamond, metal needle, or other sharp implement (including sand) or with a rotating wheel (Newman 1977, p. 107; Wilson 1994, p. 43). Wheel Engraving. The process of decorating the surface of glass with pictorial or formal decorations or inscriptions by the grinding action wheels. Stone-wheel engraving, which is basically the same technique as that used in glass cutting and smoothing, uses a water-wet stone wheel and no abrasive mixture. Copper-wheel engraving, on the other hand, applies a mixture of oil and emery or oil and Carborumdum to its wheels which may be made of metals other than copper. (Newman 1977, p. 340; Wilson 1994, p. 43). The following account of the copper-wheel engraving process is taken from an article, “The Dorflingers’ Contribution to the White House Glass,” written by David J. Dorflinger and published in The Acorn, Vol. 9, p. 42 . It concisely summarizes the engraver’s technique, in this case as applied to a set of tableware cut in the Russian patttern that was first ordered from C. Dorflinger & Sons in 1891, during the administration of President Benjamin Harrison. The seal referred to is a variation of the Great Seal of the United States which was engraved on each piece. Intaglio Engraving. “The style of decoration created by engraving or cutting below the surface of the glass so that the apparent elevations of the design are hollowed out and an impression from the design yields an image in relief. The background is not cut away, but is left in the plane of the highest areas of the design.” (Newman 1977, p. 159) A lathe, equipped with small stone wheels, is used. For a more complete explanation, please see the “British Intaglio” section in the Engraving 6 file. Dorflinger, D. J., 1996: The engraver: an addendum — copper vs. stone, The Hobstar, Vol. 19, No. 2, pp. 1, 6-7 (Oct 1996). Farrar, E. S., 1977: The master engravers of Corning, New York, The Magazine Antiques, Oct 1977, pp. 726-31. Fauster, C. U., 1975: Vaupel engraved masterpieces acquired by major museums, The Glass Club Bulletin, No. 113, pp. 1, 3-7 (Aug 1975). Ferland, Donald, 1995/6: Elegant simplicity as created by Louis Friedrich Vaupel, master copper-wheel glass engraver, The Acorn, Vol. 6, pp. 91-116. Fuchs, B. B. 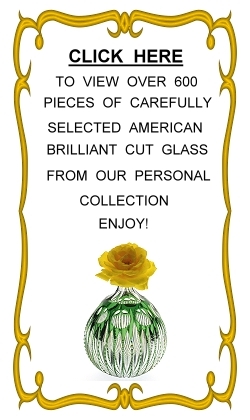 (editor), 1998: On the cover [Stevens and Williams “rock crystal”], The Glass Club Bulletin, No. 183, cover and p. 3 (fall 1998). Kohut, John, 2004: Donated to ACGA: historically significant copper wheel lathe, The Hobstar, Vol. 27, No. 4, cover and pp. 4422-30. Nicholson, Robin, 2003: Engraved Jacobite glasses, The Magazine Antiques, June 2003, pp. 80-85. Rakow, J. K. and L. S. Rakow, 1991: Stuart and Sons’ cameo and English rock-crystal-cut glass, The Magazine Antiques, Feb 1991, pp. 382-7.